Closed cell foam for 712 m - THE PORTAL HUB - Pinzgauers, Haflingers, Volvo 303s and more! Has anybody got any recommendations for foam in the rear of the top of my 712m and where can I purchase it. Too much to sort through on Amazon or Ebay. Help will be much appreciated. on the application and what your trying to solve/improve. But, I have had good experience with Second Skin Audio's products, made in U.S.A.
eBay or Amazon -- IMHO. Thanks Rmel I guess I should of thought it through a little better. I'm wanting to insulate from the heat in summer and the cold here in Oklahoma. I have a eberspacher but it can't keep up with the curtain rolled up. 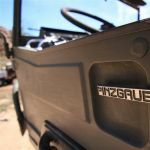 I suspect you are well aware of the Pinzgauer insulated tops and cab separator from TuffRiverStuff dot COM. Also hearing on this forum there's a rather deep backlog unfortunately. I have had really good luck just using the surplus military wool blankets. They do a good job with insulating and when needed can be used or more specific applications. 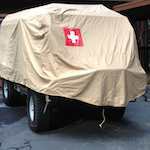 I currently have one in my Swiss G to help with the summer heat and help keep the flapping down when at highway speeds. Works well and is fairly inexpensive.